Paragon Hard Disk Manager 14 Professional is a comprehensive suite of tools that comes ready to handle all your hard drive management needs. The package includes everything you get in Hard Disk Manager 14 Suite. You can create, format, merge, split, delete or undelete partitions. You're able to back up anything from emails, to your documents folder, individual partitions or an entire hard drive. And there are tools to copy drives, fix boot problems, save drives to virtual disk formats, convert drives between file systems (no formatting required), wipe disks to destroy confidential data, and more. Paragon Hard Disk Manager 14 Professional takes this further with Bitlocker and dynamic volume support. Low-level optimisations - change cluster size, defragment/ compact the MFT - ensure the maximum possible performance. You get more backup and virtualisation options; a GPT Loader allows Windows XP systems to access modern high-capacity drives; and powerful scripting tools mean you can automate all of these operations, without any browsing through the GUI. New features to both suites (Suite and Professonal) include the pVHD format, a special VHD file which comes optimised for backups. You can save partitions or entire disks - real or virtual - to pVHDs, then mount and restore them from Windows, WinPE or Linux. A new, simpler Recovery Media Builder can build bootable WinPE or Linux-based recovery environments itself, with no need to install further Windows development tools (ADK, WAIK). If you're a regular home user, just looking for straightforward partitioning, copy and backup tools, then this is probably overkill. Take a look at the Suite version as an alternative. Paragon Hard Disk Manager 14 does provide an array of reliable and effective hard drive tools, though, most powered by helpful wizards so they're extremely easy to use. If you need a solid all-in-one package, crammed with business-oriented extras, then it's definitely worth a try. Please note, the trial version doesn't include Paragon's Recovery Media Builder, and some of its operations are available in virtual mode only. 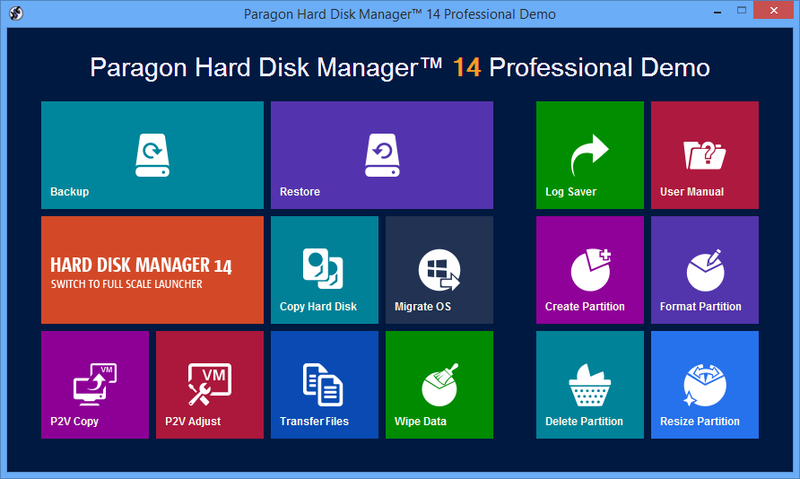 We're still not overly impressed by the backup tools, but the one-stop, do-everything Paragon Hard Disk Manager 14 Professional delivers elsewhere with a stack of effective and reliable features.